MARTINSVILLE, Va. — The No. 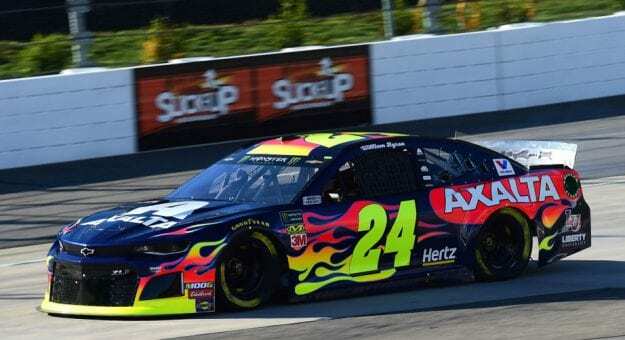 24 Chevrolet of driver William Byron failed pre-race inspection Sunday morning at Martinsville Speedway, dropping the car to the bottom of the starting lineup for Sunday’s STP 500 (2 p.m. ET, FS1, MRN, SiriusXM). After the inspection failure for mechanical measurements, NASCAR officials disallowed the car’s speed posted in Saturday’s Busch Pole Qualifying session. Byron was scheduled to take the green flag sixth in Sunday’s 500-lapper, but instead will start 34th. The right side of Byron’s car was damaged in Saturday’s opening practice when it hit the wall, and he took it to the garage for repairs. Byron’s car passed inspection on its second time through. Joey Logano won the provisional Busch Pole in Saturday’s qualifying session, marking his fifth pole position at the .526-mile track since 2015. His Team Penske No. 22 Ford was all clear in its pass through the inspection stations. The No. 77 Spire Motorsports Chevrolet driven by D.J. Kennington also failed the Optical Scanning Station and will start 35th. Kennington qualified 34th on Saturday. The No. 52 Rick Ware Racing Chevrolet of Jeb Burton was the third car marked as TD (time disallowed) on the official lineup sheet, and he will start 36th.